A team of former U.S. military special operations members are serving their country, even after they have left the military. Team members from the International Harbor Foundation saved people trapped by Hurricane Harvey's severe flooding in the Houston, Texas area, Fox 26 reported. The Houston-based nonprofit organization, comprised mostly of those who previously took part in U.S. special forces missions, usually conducts undercover operations in order to combat human trafficking. As a result, the former special operators are unable to show their faces on camera. One member of the team, called "John," said the team saved 35 people trapped by the floods. "When we were doing the rescues here, we pulled 35 people out of this neighborhood," John said. "Directly where we were standing now, the water was about bellybutton height. On the back side of the neighborhood, it was 12 feet at street level." The nonprofit's spokeswoman, Jennifer Hagler, said the organization is focusing its efforts on small towns near Houston and Beaumont. "The small ones really need it," Hagler said. 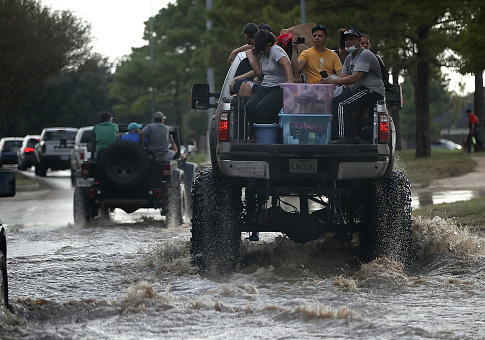 "They don't have the resources and stuff as Houston proper, so they really need the help." Now that the flood waters are receding, the team is going back into the flooded neighborhoods to help the impacted Texans "fight government red tape," and "deal with" FEMA so they are able to rebuild their homes. This entry was posted in Issues and tagged FEMA, Hurricane Harvey, Military. Bookmark the permalink.